White is always right. You will never go wrong with a white pocket square. 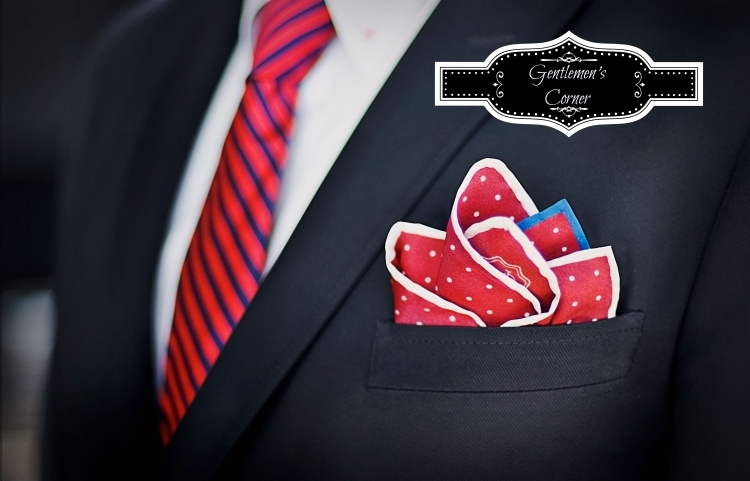 It matches all suit combinations, and is a classic with a traditional touch. Contrast a conservative suit with a bold pocket square and vice versa. We’ve all heard the phrase " The opposites attracts.". With a muted grey, black, or brown suit it is nearly impossible to go too bright with your pocket square. DO NOT AND I REPEAT DO NOT match your pocket square with your tie. A perfect match looks tacky and over planned. However the pocket square should compliment the tie. AND NEVER, EVER buy those tie-and-pocket-square sets. The hallmark of an amateur is the exact match (besides Weddings). For the Fabric? You either going to pick cotton or silk. Cotton is for sharp, crisp folds and can pretty much go with anything. When you choose silk, you’re usually going for a classier look. Silk can be used in a very casual puff fold, but if you put in the effort for a point fold with a silk square, you’re probably going to use that look in more formal/business situations. About the Color. Well here you have as many options as you do with ties. Solid colors are easy to match and keep the look very clean. Patterned squares let you have a little fun with your Outfit, and can give you that extra "something" when you need it the most. Little extra tip: With patterned ties, you will definitely look professional and very well dressed with a solid color square. The white cotton pocket square is your workhorse. If you buy one pocket square, this is the one to buy.If you ever are in a rush to get out the door and don’t have time to mess around with colors and patterns, you’re going to take this one. It goes with literally every outfit and color combination imaginable, and it is always accepted.